Check out the video at the bottom of this page. Hunter and I made the detour on our epic road trip on US Highway 71 to watch the making of the famed round patties and to see how they were made. Elve Otwell had been working at a candy company in the 1950s. The company made a lot of different confections, including peanut patties. But Otwell didn't care for how they were made, so he came up with a new recipe and started making his own. Thus, the Elve's Peanut Patty Company was born in 1956. Elve's Peanut Patties spotted at Monster Mart in Fouke. Over the years, his peanut patties gained wide renown. They became a staple at the Four States Fair in Texarkana each year, and at just about every gas station and grocery store in Miller County and beyond. A few years back, Mr. Otwell decided to retire. He first sold the business to Pam Brackman, who in turn sold it to Joe and Shelly Hickey. Today, Mr. Otwell and Pam and Shelly are the only people who know the recipe and the exact ratios involved in making those peanut patties. First thing you need to know is that the product is always fresh. If you order your peanut patties online, they're made after you order. They're available in boxes of 20 that way, which is great if you don't live in the area and you'd like your own. 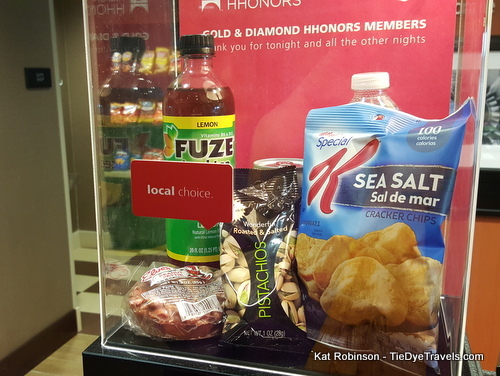 the snacks Gold and Diamond members can choose. 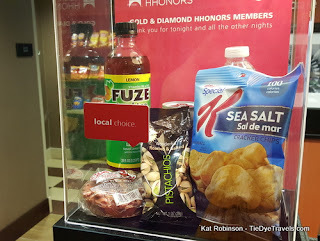 Monster Mart in Fouke, and the Hampton Inn in Texarkana. The second thing you need to know is - all peanut patties are not created equal. Almost to the letter, every peanut patty I've seen except those sold by Elve's are pink or red. That's due to food coloring, and it's just not necessary. The patties Elve's makes are a little pinkish, but that's because peanut skins can be a little reddish. At times, they're not. Shelly told me while we were watching the pour that sometimes peanuts come in very pale, even almost white. Like other crops, there are a lot of variables in growing peanuts, and they can come out a variety of colors. The peanuts used are actually from within a short distance, from Texas and Oklahoma. 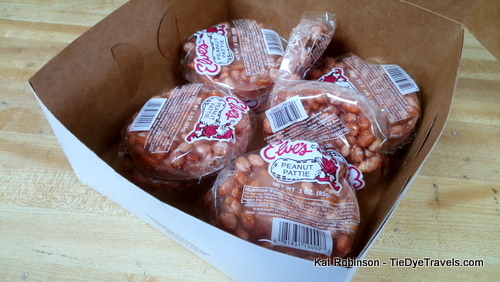 They could be from Arkansas, when there are enough peanuts being produced to purchase them, but Texarkana is a border town and these peanuts are still local to Elve's. are simple - peanuts, corn syrup, sugar, vanilla. That's all. As Shelly worked on pouring in the candy, her assistant used the back of a spoon to smush the mixture down into the rings. A lot ended up outside the rings, but that's all right. I'll show you why in a minute. This little operation isn't open to the general public. Some candy places offer tours, but all that's made here are the peanut patties. That's okay, I'm showing you around. Shelly says Elve's Peanut Patty Company goes through about 1500 pounds of peanuts a month on an average month, but much more during the Four States Fair, when new patties are delivered daily to the fairgrounds. of the table, creating a steel wave under the patties in their steel rings. This breaks them into patties and crumbles. Once the patties are transferred to steel tubs, the rings are removed and Elve's Peanut Patty Crumbles are made from the remaining candy on the sheet. It's a good use of the candy and means there's no waste afterwards. Afterwards, each patty is wrapped and sealed... and it's ready to go. If you'd like to order your own, check out this website. followed by a tour of Arkansas's oldest movie house, Scott Theater in Waldron. As far as I am concerned, these are the BEST Peanut Patties on the planet! We don't have them in this part of California so I indulge whenever I travel to Arkansas and Texas. I hope the company never stops making them. These are the best peanut patties i have ever tasted my mom knows that we are we are looking awaiting mom to bring this treat when she comes from arkansas to us in california i have had many but these are the best ...this is gods work....lol . I love love love these peanut patties! No substitute please. Only Elve’s will do!